Make a shape with the paths tool. Export that as a gimp SVG file. Convert the text to a path for opening in Gimp. I like that you show how Gimp and Inkscape can work in unison and swap back and forth paths ! BTW, instead of converting text into a path, ungroup and 'Combine', you can just 'Union' and get the whole process i one step instead of three. What i would have done differently is exporting the text as a bitmap instead of a path. For example when making a brush bitmap, i would never import the path into Gimp, i would just use the exported bitmap. Its true on the other that sometimes importing a path into Gimp has benefits. Especially when Gimp can do things with paths, that Inkscape cant (sadly that happens quite a lot). (11-18-2017, 11:12 AM)Espermaschine Wrote: Nice video ! Sorry, but AFAIK, neither 'Combine' nor 'Union' in Inkcaspe would work for importing 'Text as path' (nor any path with 'holes' like O or subpaths like i) into Gimp. 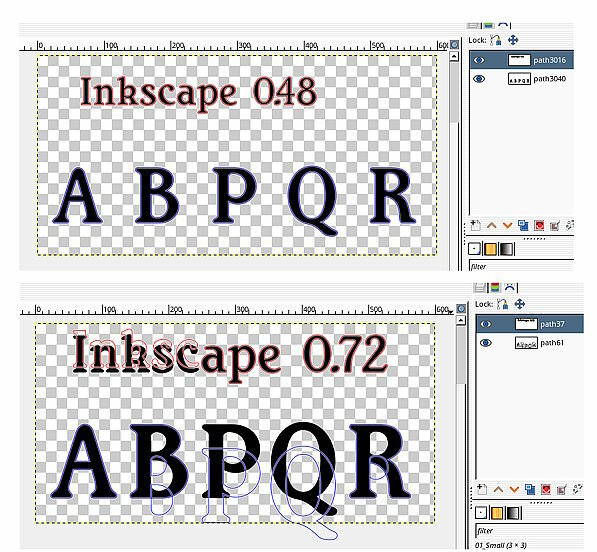 In the picture, the texts below are real fonts, with the paths as exported to SVG, while above are the paths as edited in Inkscape, re-imported and filled. In Gimp, go to the Path tab and click 'Import path', SELECTING in the import dialog 'Merge imported paths' AND NOTHING ELSE. (11-05-2018, 08:47 PM)carmen Wrote: Sorry, but AFAIK, neither 'Combine' nor 'Union' in Inkcaspe would work for importing 'Text as path' (nor any path with 'holes' like O or subpaths like i) into Gimp. Yes, i can can confirm, sometimes after editing text in Inkscape and re-importing into Gimp, some elements of a letter are off (displaced). But its not every time. For some reason Gimp sees elements of a path differently than Inkscape. These elements are always part of a compound path (like the hole in the letter o). I thought its some kind of bug or perhaps due to a badly designed font. Good to know its fixable with the 'Break Apart' action you described ! EDIT: i just tried the 'Union' method with five different fonts and they all imported okay into Gimp, so i think its definitely dependent on the font you use. Instead of complaining about Gimp has anyone considered that Inkscape might be at fault. I have seen the displacement of some elements of Inkscape text converted to a path for some time. Yes--the last example is what I used to get when importing .svg saved from inkscape 9.2.3--tested saved as defalt/plain svg/optimized svg (the ligther option, for including in ePub) WITHOUT breaking the path. It seems that the trouble (apparently with relative placement of subpats) is Gimp-specific. Fortunately I can run the malformed Inkscape svg through SK1 https://sk1project.net/ to get a corrected file. (11-06-2018, 01:36 PM)rich2005 Wrote: Fortunately I can run the malformed Inkscape svg through SK1 https://sk1project.net/ to get a corrected file. Thanks a lot for the link--I am going to try it. It is a very simple application, same as anything else, has its own way of working. What I use it for is an easy convert of a Gimp bitmap to CMYK, add your text then one of the few small applications that produces a correct CMYK PDF without have to fire up Scribus. (11-05-2018, 11:11 PM)Espermaschine Wrote: EDIT: i just tried the 'Union' method with five different fonts and they all imported okay into Gimp, so i think its definitely dependent on the font you use. Here is a screenshot of the effect of 'union' in Inkscape, AFTER the path has been broken apart: the interior boundaries have disappered. If it hasn't been broken apart, 'union' is redundant, as Gimp exports text to a single path ... unless you wish to apply the union to some texts exported piecewise. That should work alright, provided no breaking apart has been done... Only, you can get displacement on importing to Gimp. Capture made under the 'node' tool, to show the actual paths--enlarge to view their individual bounding-boxes in the 'before' example; Inkscape 0.92 under Windows7. Note: Once the text has been converted to path, one is dealing with the behaviour of paths--point. I cannot see how the actual font from which the path was derived can matter.